Déols, Ardentes, Châtillon-sur-Indre, Neuvy-Pailloux, Neuvy-St-Sepulcre, Saint-Gaultier, Saint-Genou. 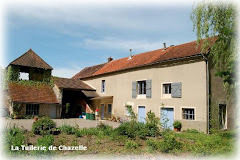 A quick look on the map and the calendar (to check the time available) showed that we certainly would skip Châtillon-sur-Indre; that was just a trifle too far away from where we stayed. We had chosen Bourges for a day out with the three of us, and the other churches we might be able to fit in during the time my son was occupying himself. Because we did not have a Michelin Green Guide for this area, we purchased one and found some more interesting things to visit in the area. Below a very concise summary, including a link to the appropriate Picasa album. Déols : an interesting part of an abbey church, with some remnants of the abbey buildings surrounding it. Saint-Genou : an interesting church, inside as well as outside. On the edge of the town we found a Lanterne des Morts, a sort of beacon possibly in memory of the dead. 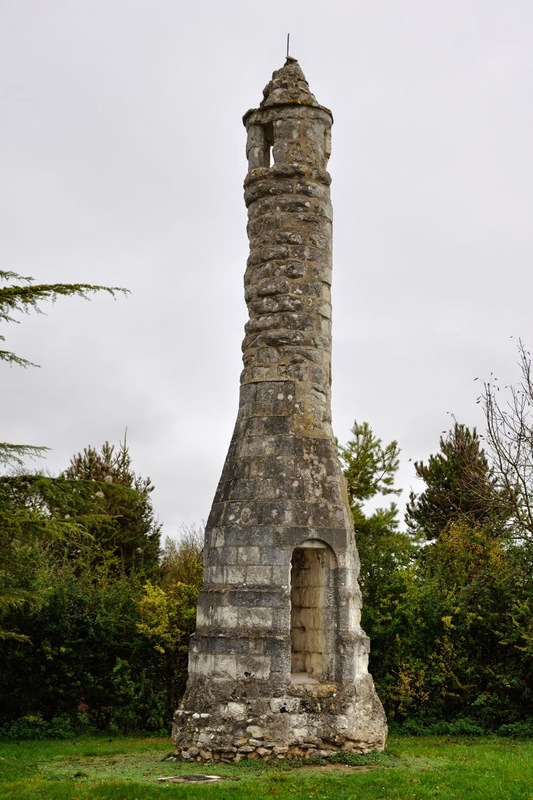 There are more in this area; the origin and purpose of these structures is rather obscure. 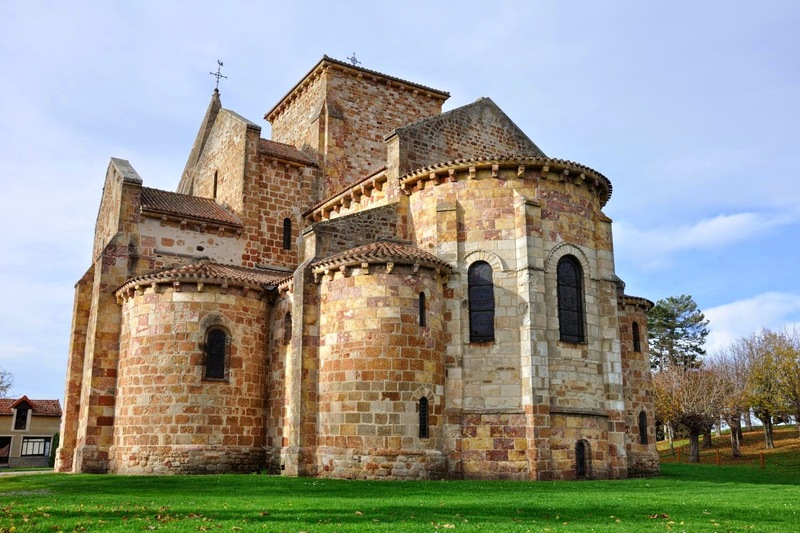 Most of them have been built in the 12th century and are mainly concentrated in the area which formed the Duchy of Aquitaine in the 10th century. Ardentes : the church there was locked, but when we came back a few days later, we obtained the key without any problems from the town hall. Interesting church. Neuvy-Pailloux : most of the church had been demolished. 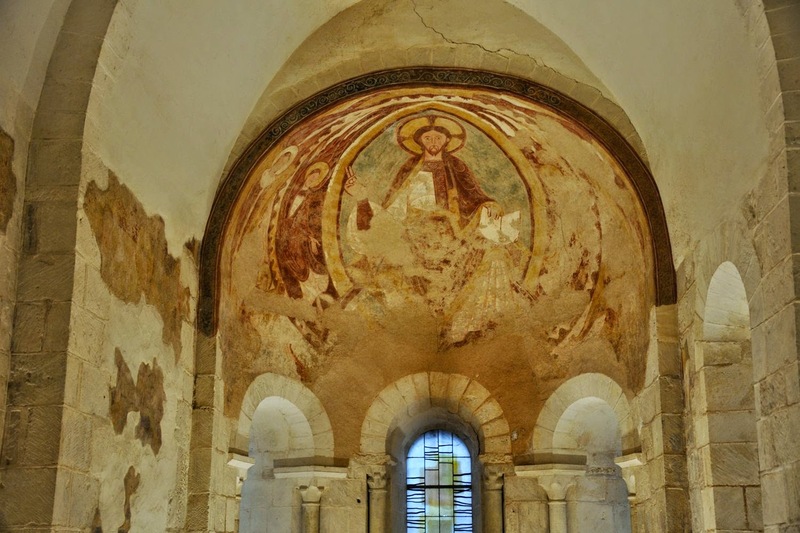 The apse however has an interesting ceiling painting. Neuvy-Saint-Sépulchre : the first rotunda church I have seen in France. 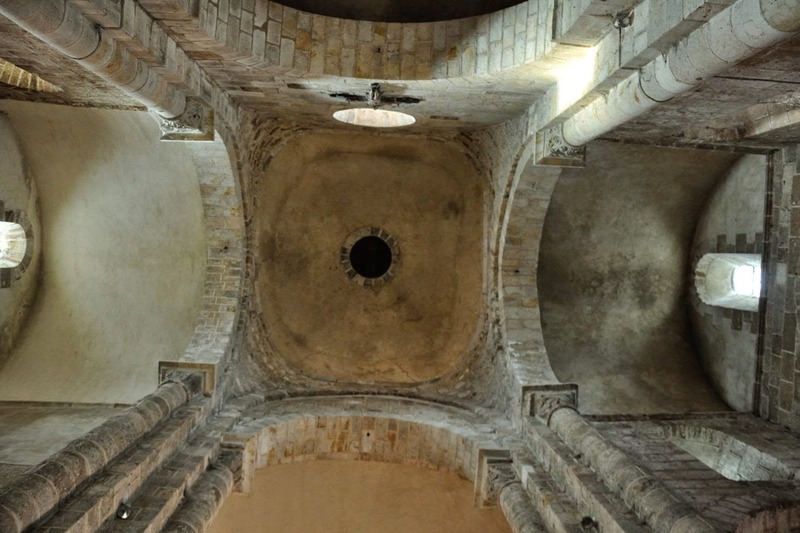 The church was built based on instructions of Eudes de Déols, who had seen the Saint-Sépulchre church in Jerualem. Because the example was a round church, the “old” rectangular building was partially demolished. However, when new pilgrims arrived from the holy land, they had seen that the church in Jerusalem had a rectangular part as well. That was the reason why demolition of the old rectangular church was stopped. Saint-Gaultier : interesting church, with nicely decorated chevet. For the churches not on my homework list, see the next blog. 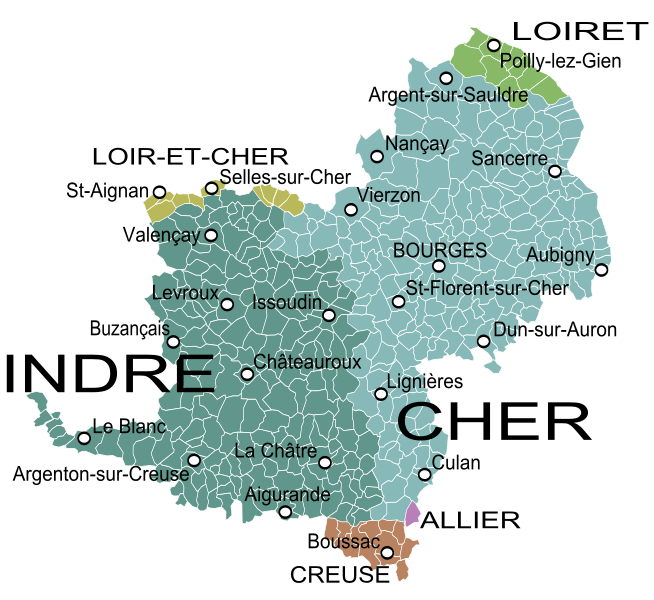 Although the emphasis of this blog lies on Burgundy, every so often I deviate a little from this area. 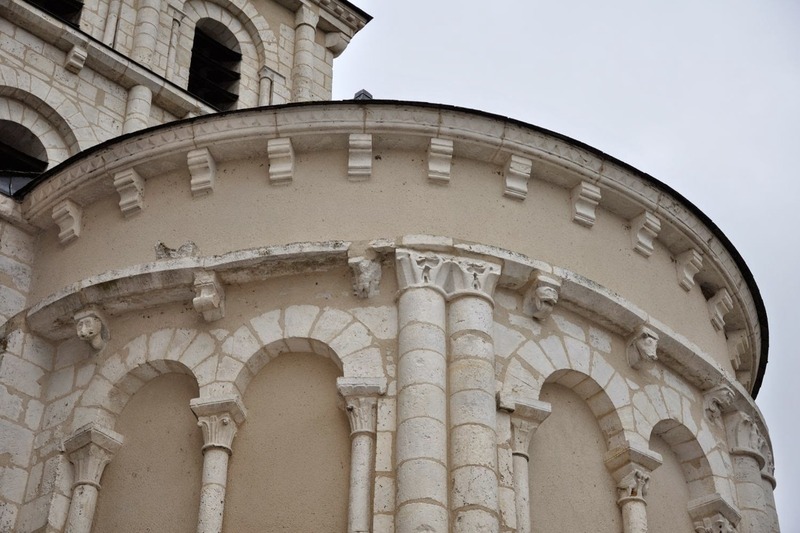 When we were planning a trip into the Berry region, I had asked my walking encyclopedia on Romanesque churches for some advice concerning this area. We went there to meet up with my son, who was going to spend a day with some local guitar restorers, and decided to do some sightseeing as well since we were there. Berry is a former Duchy and it was until 1790 a province of France with as a capital Bourges. Both departments Indre (36) and Cher (18) in the Centre region form more or less the old Berry. We stayed in the Southern part of Indre, near La Châtre, famous because George Sand lived around there. It was a totally unknown area for me. The only thing I knew had something to do with the Berry were the “passages berrichons”, narrow wall openings on both side of the choir in a church, giving access to the transept from the nave. 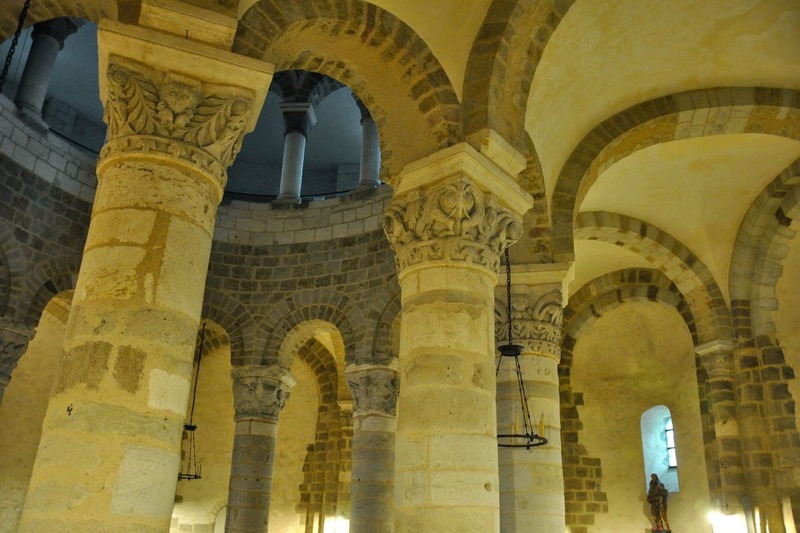 These wall openings one finds sporadically in some Romanesque churches in Burgundy. And further I had heard and seen something of the “Très Riches Heures du Duc de Berry”, and everyone who has ever done some calligraphy will admit that this is a jewel of illumination. On our way to the Berry we drove through Allier (03) and halfway Montluçon and our destination we saw a sign “Saint-Désiré Eglise Romane”. Since we were a trifle on the early side we decided to pay a quick visit to this church. 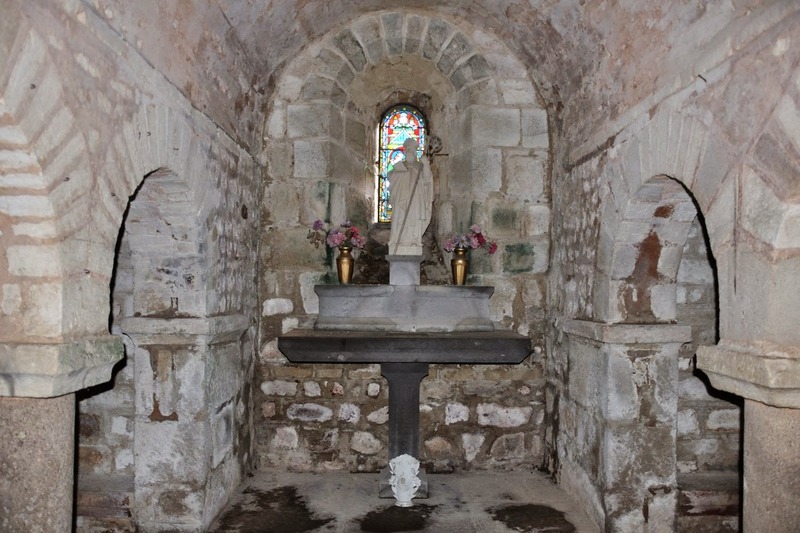 The church had once been part of a priory, and it had an 11th century crypt built around the grave of a former bishop of Bourges, Saint-Désiré. The church had been shortened in the 19th century and partially heavily restored (see “Wikipedia - Église Saint-Désiré de Saint-Désiré”), but what is left over is still quite interesting. And this church was not even on my list!